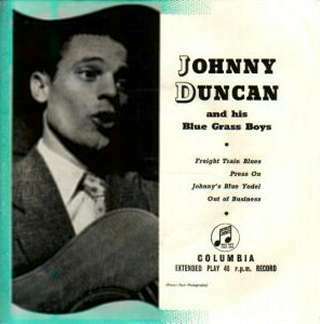 Johnny Duncan and the Blue Grass Boys are now regularly classified as participants in the skiffle craze that hit the UK at the end of the 1950s. In fact Johnny Duncan had a much more distinctive sound than any regular skiffler and his choice of material was closer to true 'Hillbilly' country music than was being played in any of London's coffee bars of the day. According to Charles McDevitt, in his excellent book "SKIFFLE, the Definitive Inside Story" (ISBN 1-86105-140-9), Johnny Duncan was born in Michigan where he grew up- a fact given to him by Johnny Duncan's brother. However, his family currently claim that Johnny really did come from Tennessee. Other biographical references also sometimes refer to an earlier birth year- confusion caused, it is alleged, by Johnny Duncan falsifying the date in order to enlist in the armed services. Johnny Duncan's style may have owed a lot to the fact that he was an American and could therefore carry a country and western style with more confidence than could most of his British contemporaries. He had been stationed in England with the US armed forces during the early 1950s and as a result had fallen in love and married an English girl. After returning home for a while after demobilisation, he decided to return and settle in the UK with his new wife. John had learned the guitar during his childhood and had developed a passion for American country music while in his teens- thus having some experience of playing in small groups from that time. His first engagement in the UK came with the Chris Barber Band after a brief audition. However, this coupling did not last long before Duncan had broken away, gained his own backing musicians and a recording contract with Columbia. His second release "Last Train To San Fernando" perhaps fell into the same railroad category as the earlier skiffle classics "Rock Island Line" and "Freight Train". Despite, or possibly because of, this the British public loved it and sent it almost to the top. It was narrowly held back from the very top spot by a song called 'Diana', sung by a very young Paul Anka. However, paradoxically perhaps, unlike Donegan and Chas. McDevitt, Duncan never got much recognition in his native US. Although Johnny Duncan's first EP release (SEG7708-left) was compiled from his singles releases, the second (SEG7773- right) featured new material. The group went on to score two further, much less memorable, hits in quick succession. Unfortunately, Johnny Duncan was unable to find another substantial hit to consolidate himself as a long term recording artist. Despite this the group remained popular for a long time after interest in his big hit had waned- probably aided by regular exposure on BBC radio's "Saturday Club" where his falsetto output could be listened to on most weekends. Although, he had no further hits he carried on producing good singles for Columbia over the next three years. He then switched recording companies as most artists did after a long absence from the chart- then unlike most other artists- he returned to his original label, Columbia. 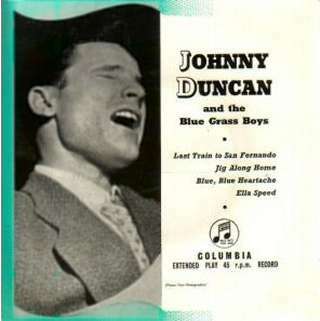 Perhaps Johnny Duncan's distinctive style became a handicap that made it difficult for him to produce a new 'sound' that would once again attract record buyers. In any event, by the mid-1970s Johnny Duncan decided that his future no longer belonged in Britain and he resettled in Australia. Johnny Duncan died during 2000.